This is the second part of a previous post about a road trip I took to a casino show with Jim Brunzell. We were driving on the way to the casino, and it came up in conversation that I’m a referee on the card. Jim asks me what name I use when I referee. Hmmm… I assumed I was just going to use my normal ring name- minus the “Dr.”. But I wouldn’t have to, would I? When I wrestled around the Twin Cities area, I wouldn’t think of using a different name as a referee because people knew me. Even if we went outside the area a bit, there were usually a few fans that made the trek. But where we were going, I had the freedom to do whatever I wanted. Maybe being in the car with an old-school veteran was rubbing off on me, or the subconscious influence from watching guys like Eddie Sharkey, but my first thought was to have some connection to a person the general public would know. Someone famous. But who? It would have to be believable… wait a minute. That’s it! Why didn’t I think of it before? What’s the comment I get from people all the time, even people that don’t know me? Even if they don’t say it to my face, I hear them talking as they walk by. At one time I actually had a “contact of a contact” of someone who ran a business of celebrity impersonators. You know the ones- Burt Reynolds, Dolly Parton, and lesser known celebrities like the kid from “The Wonder Years” (I don’t think Fred Savage look-alikes make the big $$$). The problem is that I look like McGwire only from the neck up. Or to be more precise, from the neck up to the hairline (but that would be covered by the prop baseball cap). Once you go below the neck, the illusion is shattered. I definitely don’t have his pipes, or even his legs. I imagined myself being “rented out” to a kid’s birthday party, but having to stand in another room and just peek around the corner so as to only show my head. “I’ll just stay back here… uh… in case my agent calls.” And what about a booking in a more open space? Would I have to bring something with me to hide behind? Could I bill myself as “Mark McGwire in an Iron Lung“? Probably not something you could make a career out of. Those in the wrestling business (and guys like the late Andy Kaufman) get a kick out of seeing if they can be convincing enough to make someone believe something that is not entirely true. It’s both a challenge and a form of entertainment. Being “on the road” seemed like a perfect opportunity to have a little fun. Before the show started the ring announcer, who was provided by the casino, asked me my name. I told him it was Marty. Marty McGwire. 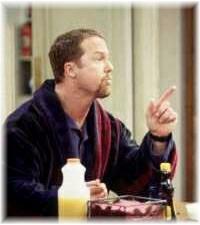 After the first match I ref’d, several kids came up to me and asked if I was related to Mark McGwire. Ok, hadn’t expected anyone to call me on it. Thought I would just get by with implying it. “Yes. I’m his cousin.“, I said. “Can I get your autograph?” one of them said. I signed a few autographs on programs and various scraps of paper that the kids could find. They didn’t seem to care what it was, as long as it wasn’t edible. I think there was only one other referee on duty that day. Most likely it was Jay Soltis, but I don’t remember for sure. We would alternate between the two of us, each taking every other match. At the end of a match, I would get a few more kids coming up for autographs or questions. Same thing at intermission. The way the match order worked out, I ended up as the ref for a match between Brunzell and “Wild Bill” Irwin, another wrestling veteran. I’d been to local shows before as a fan and seen some of the veterans in the ring. Usually the reaction was that the matches were good, but nothing extraordinary. Always pretty solid. Always good to see that they can still get in there when they’re past their prime. When I wrestled, I would like to have a few days or even weeks to think about an upcoming match, if possible. What moves did I have in my arsenal that would work against this opponent? Were they larger, smaller, or equal to my size? What wrestling style did they use? Should I try to match it or counter it? Did I need to work on anything in wrestling camp before the match to perfect it? I’m 100% sure that Jim was not thinking about this match during the trip. I’m very sure that he wasn’t thinking about it while he was lacing his boots up before the match. I would almost bet money that on the way to the ring neither he nor Irwin had thought about it. Yet when the bell rang, they had a very entertaining old-school contest that the crowd was solidly behind. It’s the equivalent of someone walking up to a microphone without any forethought and speaking a short story on the fly. Not reciting some memorized text that they had written earlier, but actually creating the story at that instant, customizing the cliffhangers based on the audience’s reaction. If you attempted to do that and came out with something even grammatically correct you would be happy. But to expect an actual literary work every time would be ridiculous. Yet that’s what these guys can deliver, time after time after time. Sure, some of the chapters seem like something you’ve read before, and some of the endings can be a little cliche. But it all fits together with a beginning, middle, and end, and with enough twists and turns to hold your attention. By the end of the day, the ring announcer and several adults in the crowd had picked up on my supposed fame as well. They all had a few questions about cousin Mark. I think what sold them is that I didn’t go around bragging about it. To them, I’m sure it seemed like I was reluctant to talk about it as if I didn’t want to be in the spotlight. As if I was constantly trying to stay away from all the “media” attention. The truth was that I’m not really a sports fan, so I was trying to keep from saying anything stupid that would expose my lack of even basic trivia about the man. Not a bad day. I got to referee for a couple of veterans and see first hand how they worked. I got to have a little fun with the fans, and a few “lucky” kids left thinking that they had a brush with celebrity they could brag to their friends about (or sell on eBay). At least until they got home, when their parents would realize that I had misspelled “McGwire” with a ‘u’ instead of a ‘w’. Like I said- not a big sports fan. With all of the coverage of the baseball “scandal” in the news recently, it made me think of a story from a few years ago that I thought I would share. I believe it was around the summer of 1999. I was added to a wrestling card at the last minute as a referee. This was a Friday night and the show was the following day at a casino in Menominee, WI. At this point, all of the cars were full. Even if I was crazy enough to ride in a trunk, there wasn’t any room with all the gear. I gave the promoter Eddie Sharkey a call to see who else was going to be on the card, hoping I would get another lead on a ride. He told me that Billy Blaze was on there and to give him a call and see if he had room. I had a work number for Bill that I could try. Now, here’s the thing about my experience in the wrestling business- it didn’t matter how many years I had known you, the chances are that I have no idea what your real name is. Most of the time you referred to the other wrestlers by their ring name. Didn’t matter whether we worked together in training camp every other day or not. If you knew them really well, you might actually know their real first name and use occasionally (esp. if you’re not at a wrestling event). As a side note, I remember seeing some discussions about the 1998 documentary “Wrestling with Shadows“, and whether the screwjob on Bret Hart was real or not. One thing that people pointed out as evidence that it wasn’t real was that Bret’s wife called Triple H “Hunter” in their conversation, rather than his real name. From my experience, if anything it adds more credibility to the dialog. The only ones that use a wrestler’s real name are the marks that try to show they’re smart, or reporters that think it somehow adds to the story (e.g. …Hulk Hogan, whose real name is Terry Gene Bollea, …). I call Bill’s work phone and found what I expected- there was more than one Bill there. Dammit! The person on the phone asked if I wanted Bill Xyz or Bill Yxx (to this day I don’t know what his last name is). I said, “Uhh… I think the second one. Is he the wrestler guy?“. I got Bill’s number, but it turned out he had left a day early. I then called Eddie back to tell him I was out of ideas. 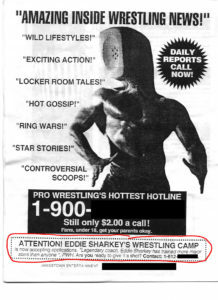 “Give Jim Brunzell a call.“, Eddie says. Loooong pause. “Uh… what?“, I say. “He’s heading out there.“, Eddie says. “Here’s his number…“. “Wait… Jim BRUNZELL?!? ‘Jumping’ Jim Brunzell? AWA Jim Brunzell? WWF Jim Brunzell? Killer Bees Jim Brunzell?“. To Eddie, we were all workers. So what if one of us had been a tag team champion in several major promotions? I met Brunzell at a Perkins near White Bear Lake, MN. The trip to the casino was about 320 miles one way. If you are a member of law enforcement, I would tell you that it took us about (320 mi / 55 mph = ) 5.8 hrs to get there. If you’re not, let’s just say we got there a little quicker than that. But regardless, I was spending a full day in the car with the legend Jim Brunzell. The Road: Compared to what these wrestling pioneers went through, we had it incredibly easy. These guys would be on a schedule where they were expected to be in Winnipeg one day and Chicago the next. Since they were responsible for their own transportation, they would pile into cars to save money. Spending all that time cooped up in vehicles cut down on the amount of training you could do, which led to the use of performance enhancement for some people. Reptilian Roommate: Spending your own money on travel and lodging means that you are also sharing rooms. You get exposed to people’s “habits” (performance-enhancing or otherwise), extramarital activities, enlistment of services from those in the “people industry”, and exotic pets (snakes, for example). Sometimes one individual covers all of the above, and would describe them in a documentary a decade or so later. Stylin’ and Profilin’: Stories about a certain multi-time heavyweight champion showing that he didn’t just “talk the talk”. Strutting around in the hotel pool area with a couple of beauties, wearing only a cowboy hat, cowboy boots, and a smile. Whooooooo! Hey, Someone’s In Here! : We’ve all heard about some of the downsides of celebrity. Paparazzi, stalkers, invasion of privacy. What’s one of the biggest issues for a wrestling celebrity at a local show? People trying to get an autograph while you’re in a bathroom stall. Seriously, people (mostly kids) would crawl under the stall just to get you to scribble your name on something. The takeaway from Jim was that if you had to take a dump, do it before you get to the venue (we stopped at a Wendy’s- not sure if that was an endorsement for the cleanliness of their bathrooms or not). 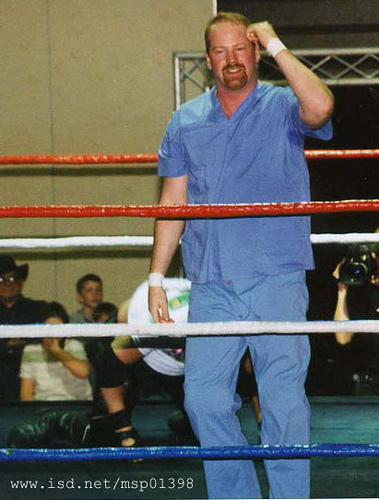 I saw him a couple more times at some wrestling cards we were on shortly before he was going to have shoulder surgery and “retire”. 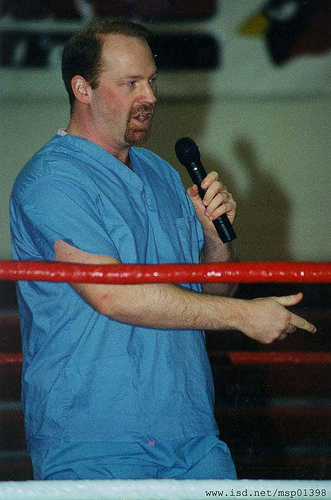 I don’t know if he ever wrestled again after surgery (I suspect he may have). I’d like to publicly thank him for being so nice to me and for treating me as an equal. What happened in between the actual driving? You mean the wrestling show? That’s actually what I thought of with the recent baseball news. There is kind of a funny story here that I haven’t gotten to yet, but I thought the drive itself deserved it’s own post. I’ll cover that part in the next one. Stay tuned.